Our May 7 meeting will feature the construction of dual band, VHF-UHF J-Pole antennas—Ed Fong’s DBJ-1. We will use an assembly line approach to build these 144/440 MHz antennas. The total cost to build this antenna is $5.00, payable to the "River City ARCS." Ed sells these antennas for about $50 once the freight costs are included. The enrollment period for this club member project is now closed. Our General meetings are usually held on the 1st Tuesday of each month at 7:30 pm and are open to the Public. Would you like a personal mentor to help get you on the air? ~9:00 pm - Slow Scan Television Net on 441.300 MHz N6NA Repeater Members and Visitors always Welcome! Club member Ioan Negru, AI6UO, invites all interested to check into his Slow Speed (5 wpm) CW Net on 28.055 MHz. During his April 2 meeting presentation, homebrewer extraordinaire Bob Mix, KF6ABC shared a glimpse into the joy that he helped many experience in the Bay Area Radio Builders' Club. 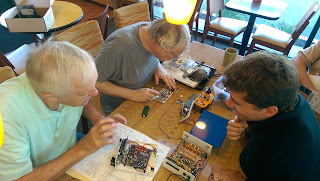 Bob extends an invitation to our club members to form a new beginners' DIYRadio group to learn and share the joy and adventure of building simple electronics and radio circuits. Please contact Bob at Bob.Mix@att.net if you are interested. June 22-23 - ARRL Field Day & Annual Family Picnic/Fox Hunt - VFW Post 6158, 8990 Kruitof Way, Fair Oaks, CA - Combined Event/New Venue! 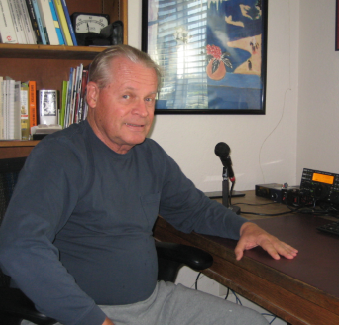 Phil Sittner, KD6RM, has a ham radio story that goes back over 50 years, from childhood. Still living in Northern California, Phil builds his own radios and test equipment, operates CW on 80 and 40 meters, using his fence mounted 80 meter end-fed Zepp and a pair of phased 40 meter verticals in an HOA neighborhood where antennas are forbidden. We harness Phil’s extensive technical expertise and hear his ham radio story in this QSO Today. All are welcome to assist and/or stop by our N6NA Amateur Radio Booth at the annual Rio Linda Historic Farm & Tractor Days. Festivities begin at 9 a.m. through 3 p.m. on Friday, May 17 (School & Youth Day) and continue from 9:00 a.m. to 4:00 p.m. Saturday, May 18 (Family & Community Day), at the Historic Dry Creek Ranch House located at 6852 Dry Creek Road in Rio Linda. your River City ARCS Membership Now! Dues received after August 31 are credited to the subsequent calendar year. Dues paid after August 31 count towards the 2019 calendar year. Member dues & donations defray our meeting, event and operating expenses. Order River City ARCS Logo caps, shirts and jackets directly from our logo apparel supplier. Call Gina Land at (916) 455-2876 or visit Danoc Manufacturing, 6015 Power Inn Rd Ste A, Sacramento CA 95824. Large Logo embroidered on back - add $18.00 plus tax. Small Logo on left chest - add $6.50 plus tax. Name and call sign on left chest - add $8.50 plus tax. ARRL: The Doctor Is In • ARRL: So Now What? We appreciate your support of the River City ARCS! This is your Club! Support it! Subpages (1): Ten Meters for Technicians and for All!